Measurement Notes: Originally the geographic coordinate are referred to El Hierro Island. Given here in Prime meridian Greenwich. Notes: See Afriterra book # 67 "Geografia dell'Africa", (and separate framed sheet); The map was drawn by Livio Sanuto. Engraved and published by his brother Guilio after the death of Livio and no other regions were completed. This map was made by the Venetian cosmographer, mathematician and maker of instruments who was among the prestigious Lafreri school of engravers. Livio Sanuto planned a complete world atlas but only finished the 12 maps of Africa before his sudden death. 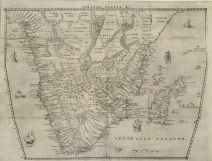 This map was based on Giacomo Gastaldi's 1564 wall-map of Africa and certain Portuguese sea charts for the mapping of the coasts and for the interior used textual accounts by Duarte Barbosa and Jo? de Barros.